Face rollers are a massage tool inspired by ancient Traditional Chinese Medicine. It helps to calm the skin, smooth fine lines and wrinkles, improve skin tone and complexion, move the lymphatic, treat sinus, reduce puffiness and dark circles, reduce inflammation and tighten pores. It provides a cooling massage whilst improving the blood circulation in the eyes, face and neck, leaving the skin naturally glowing. 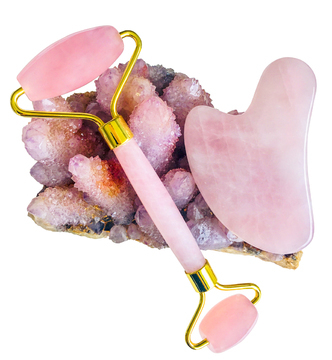 The rose quartz face rollers are double sided for use around the eyes as well as the entire face. The larger stone is great for massage around the neck, face, arms and legs, whilst the smaller stone can be used around the eyes and face area. 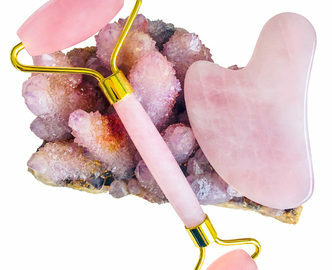 The rose quartz Gua Sha tool (massage scraping) is used to encourage the lymphatic fluid, reduce congestion around the jaw line and improve blood circulation. It can also be used for a firmer deeper massage, smoothing and contouring around the jawline and enhancing skin elasticity. It fits to the contours of your face for a more relaxing massage. Clasp the rose quartz in the palm of your hand during meditation or place it over your heart chakra or under the pillow for extra relaxation and removing negative energy whilst sleeping. Use each daily for a few minutes on face (and body) and couple it together with our anti-ageing serum for even better results. Each set comes with instructions and diagrams. Click here for more information on how to use. These highest quality rose quartz beauty stone kits are just what you need to reverse ageing enhance skin vitality. With daily use skin is noticeably smoother and more radiant. The set comes in a box with slots for the perfect storage. We guarantee the quality of these sets which are made with a smooth sturdy roller that won’t fall apart and which you will love and use for many years. Due to the natural formation of the stones, each set may vary slightly in colour. However, they all carry its own natural beauty.